Great that you’re visiting our webshop! Ordering your disposables and packages simple and easy on our organised webshop for rock bottom prices! You can choose from a very broad selection of disposables, which increases every day. Our principle? Perfection! Not only in products, but also in the service and ease of ordering, every single day! We are more than happy to provide you with a solid advice. You can trust us! Because of our years of experience in the packaging market and the many branches that exist, we can be of great service in a variety of aspects. Whether you are a starting business or a professional, everyone is welcome and you can count on real experts within the packaging business. On Monday to Friday, we are available by phone from 09.15 AM - 05.00 PM on +31(0)859020564 or by e-mail: info@disposablediscounter.com. Sending an e-mail? On working days, we try to answer it within 1 hour. 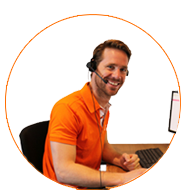 You can contact us by chat, where you will get a direct response to your questions if there is a colleague available. Do you wish to quickly order products? Then you can make use of our useful order list in your account. 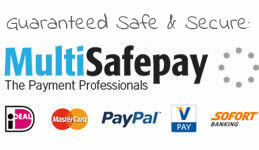 The payment runs safely through Multisafepay or on account by Billink. To whom do we deliver? We are focused on the B2B market, but of course, anyone is welcome, and because of regulation it's depending on the country you are from! Where do we deliver? At the moment all over the world! We are proud that on all continents, our products are used! Cool, right?! Products are not directly put on our webshop that easy. Before we add products to our webshop, we extensively test and assess them and check whether they satisfy our strict quality demands. Because our experts are very selective during the assessment, with us, you are ensured of high-quality products. We not only look at the product itself, but also whether it is fairly produced and complies with the obligatory laws and regulations. Our selection is set up in such a way that all products an entrepreneur needs are offered. Disposables such as cups, cutlery, plates, trays, food containers, you name it. We also offer brand products such as Duni, Kimberly-Clark, Dart, Tork, Propac etc. Brands that ensure quality! The products on our webshop, are also in stock in our own large warehouse. How? Simple, because of you! Because of our substantial growth in the last few years, we benefit from economies of scale, and that advantage, we are giving back to you! Does the volume of the products increase? Then we, unlike many other sellers, lower our prices due to better purchasing conditions. Do you wish to provide your disposable product with your own design or logo? That is possible! With our unique and useful online calculating tool, you can directly see the prices of the printed products! The products available to be printed can be found on our ‘Brand It’ page. Special requests? Please contact us, we are more than happy to assist you! 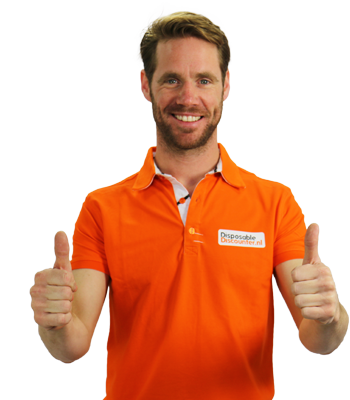 We hope you enjoy our webshop! The content of the website, the included data, images, texts and combinations of these are protected by means of copyright. Without a written approval by Disposable Discounter, it is prohibited to use the website or any part of it for own purposes, commercial purposes and prohibited to publish it, to copy it or to frame it. The images and videos on the website are the property of Disposable Discounter or given by suppliers and no rights may be derived.